The Red-throated Lorikeet (Charmosyna amabilis) is Critically Endangered in the wild due to predation by introduced mammals and logging and road clearance. Project progress: In 2001 the World Parrot Trust paid for a population survey to determine the status of the Red-throated Lorikeet. Outcomes: Working closely with the National Trust for Fiji, in 2001 the Trust sent Dr. Kirsty Swinnerton, previously a member of the Mauritius Echo Parakeet team, to carry out a preliminary survey. She reported back that a search for the Red-throated Lorikeet would be a priority, a six-month project that was completed. A subsequent survey in 2003 also failed to find any birds. In 2010, there were plans to include local communities in the Tomaniivi IBA, where people have reported seeing the birds occasionally, in the effort to locate the last known birds. It was also not sighted during continuing surveys in the highlands of Viti Levu (Monasavu/Nadarivatu) and Sovi Basin (V. Masibalavu in litt. 2012). Where found: Birds are found on Viti Levu, Ovalau, Vanua Levu and Taveuni in the Fiji Islands. History: Red-throated Lorikeets (Charmosyna amabilis) have always been considered to be rare and thinly distributed throughout their range. Observations have become extremely rare (J. S. Kretzschmar in litt. 2000, V. Masibalavu in litt. 2012). The last recording of this species was in 1993, but there was one detailed sighting in 2001 at Mt Tomaniivi on Viti Levu (P. Hayman in litt. 2004). In 1998 two birds were seen in the Nausori Highlands (G. Allport in litt. 2000). In 2001-2002 a 49-day search found no evidence of the birds on Viti Levu, where some records previously occurred (Swinnerton and Maljkovic 2002), and subsequent surveys in 2003 also failed to find any trace (G. Dutson in litt. 2003). This lorikeet has also not been seen during ongoing surveys in the highlands of Viti Levu (Monasavu/Nadarivatu) and Sovi Basin (V. Masibalavu in litt. 2012). Because of failures of numerous counts to find the species it is then assumed to be extremely rare, with a population of less than 50 birds (G. Dutson in litt. 2005). 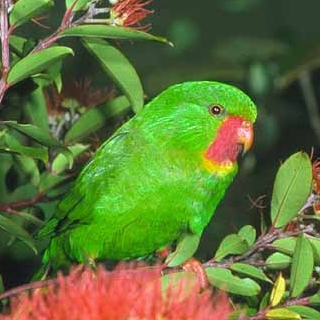 Ecology: The Red-throated Lorikeet prefers upland rainforest to 1000m (3280 ft). It has historically been observed in small flocks (5-8 birds) high in the canopy feeding on nectar and pollen from flowering trees, and most likely wanders seasonally in search for more food. They are very inconspicuous in behaviour, and hard to spot.